AS IT STANDS: Warning! 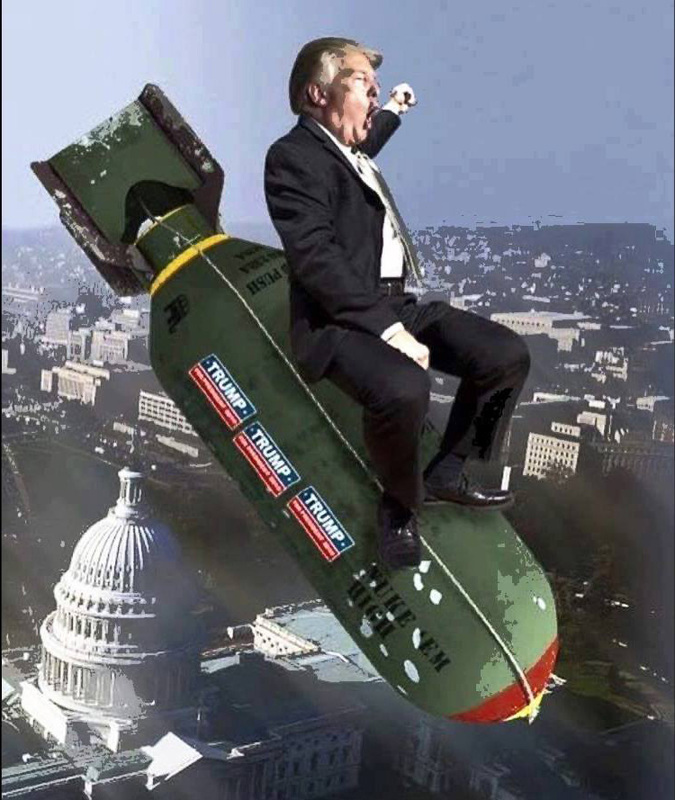 Trump the Untamed Tyrant Set To Explode! I sense were teetering on a thin wire, that if cut, will unloose nukes across the world. With criminal investigations closing in on him, and a slew of other problems, Donny is untethered, and just like a cornered rat, he's lashing out viciously; and talking nuclear superiority with Vladimir Putin, Xi Jimping, and Kim-Jong un. There's nothing Trump won't do to change the national conversation about his misdeeds. If that means starting a war...well, it's possible with someone unpredictable like him. Now that he's added "Bomb 'em and ask questions later," John Bolton, to the Trump team, the chance of an itchy nuke finger pushing that button has increased. I'm reminded of that 1964 movie, Dr. Strangelove: Or How I learned To Stop Worrying and Love The Bomb. It was a great piece of political satire that easily segues into our current political joke of a president and his crazed staff. The movie was about an unhinged US Air Force general -Jack D. Ripper - who orders a first strike nuclear attack on the Soviet Union. The president and his staff try to stop that from happening. But the B-52 Bomber is locked into the mission. At the last moment there's a problem in the bomb bay. Major T. J. "King" Kong enters the bomb bay and repairs the broken electric wiring, whereupon the doors open. With Kong straddling the bomb like a rodeo bull, it falls and detonates! You might remember that iconic scene of Slim Pickens waving his cowboy hat and yelling "Wahoooo!" as the nuke plunges down. Back to Trump and staff. I can see our Secretary of Defense, General "Mad Dog" Mattis, playing the part of Jack D. Ripper. I think ex-general John Kelly, whose now chief-of-staff, would be perfect for Slim Pickens part! The only problem I'm having is what to do with Trump? In the movie, the president wasn't a moron like him. He tried to stop that bombing from happening, unlike Donny, who I suspect would be delighted to deliver a nuke. Here we are, over 50 years after Dr.Strangelove was considered political satire, living through a similar situation in the real world.